Yes, you read that correct! This is probably the best tasting pizza bottom I have never made! I am pretty skeptical when it comes to a lot of gluten-free flours out there, but this one tops my list on every level! 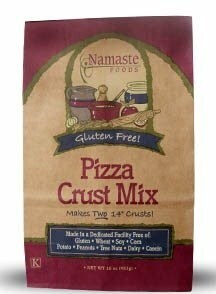 It's from the Namaste Foods brand of products and they all seem to be fantastic so far! I must say, when I mixed this up, the consistency was still very wet and weird for me - as it was like a very wet dough you had to spread out on the sheet/form to make a form of a pizza 14" wide (the package can make two 14" crusts). I had very big doubts about this crust. Then while keeping close watch in the oven, I started to trust it might actually work! This crust is great because they have already added some tasty spices into the mix. Once we covered it up with topping and threw it back in the oven for the remaining minutes, we took it out and chowed down what tasted like a dream! I got this at a local natural foods shop in town here, but I have seen this brand in a few stores. Anywhere they would carry organic foods I guarantee this brand will be there!